Can commercial beef production create prosperity? Agribusiness consultant Dr Phil Holmes looks at whether commercial beef production can create prosperity for the typical family business, and why operating return and capital return are both important. CAN commercial beef production create prosperity for the typical beef producing family? Well, yes it can, if you want it to. In fact, it can do it in two ways, unlike most other industries, because you have two bites at the cherry as a commercial beef producer. The Australian Beef Report (ABR) spells this out clearly by region, right across Australia. On the one hand, the bad news is that 75 percent of family-owned beef businesses can afford to pay themselves a decent salary or bank interest, but not both, let alone principal re-payments. On the other hand, 25pc of them can do both and prosper, and pay down debt. A stark contrast. Be aware of the constraints of operating scale. If your business falls below the threshold where operating scale is a constraint, get a part-time job to fill in the rest of the week. Focus on herd productivity: reproductive rate, mortality rate and turn-off weight as these three drivers have an overwhelming effect on herd income. You cannot have a highly profitable beef herd unless income is healthy. You cannot starve profit out of a herd with cost-cutting and prosper in the long run. Spend prudently to increase productivity. Concentrate on your cost of production per kilogram of live beef. Don’t know what it is? More than likely, you will be part of the 75pc described above. Embrace objective measurement and quantitative genetics. This is 2018, not 1818. The power of genetic improvement has been increasing exponentially since the ‘Father’ of the discipline, Gregor Johann Mendel, arrived on the scene in the 1880’s. Let modern genetic knowledge work for you as it costs nothing and can withstand objective scrutiny. Show ribbons cannot. Remember that the bull is about 30 times more important than the cow in terms of herd genetic improvement. If your seedstock source thinks winning the Champion ribbon at the Snake Gully show is more important than harnessing the power of Breedplan to both describe and improve herd genetics, then good luck. Further, if you hear the following, run a mile: ‘Good spring of rib’, ‘Stands well over his ground’, ‘Good sirey outlook’, as you are dealing with a dinosaur whose genetics are likely to produce a Jurassic result for you. Remember that only one in four bulls selected on eyeball appraisal alone will improve your herd genetically. The other three will either do nothing or send it backwards, irrespective of what the show judge thinks. In my forty years in this fantastic industry I have seen many changes, some for the better, other less so. However, a constant in that time is what sets the top producers apart. They achieve extraordinary results simply by knowing what the profit drivers are in their business and having an unrelenting focus on them. They keep things as simple as they can, avoiding the fads and trends that come and go but embracing sound science and useful technology, when they are proven and will add to their bottom line. Their approach may seem boring, and their financial performance is not always obvious from the outside, but they achieve outstanding results. The Australian Beef Report was written for the top performing producers, and for those who aspire to be one of them. It details the current performance of the industry and what profit focussed producers can do to improve their long-term performance. The Report is a valuable, independent study of the Australian beef industry that will open readers’ eyes. Authors Ian McLean and Phil Holmes have identified that the industry can be effectively broken up into two groups, the Best and the Rest. They have also identified that there are only two basic barriers to profit, and how to address these barriers is spelt out very clearly in the report. Phil Holmes* is the principal of Holmes & Co, a NSW-based firm providing professional advice to family and corporate owned farm businesses in all states of Australia. He started his career in sheep, but over time, has become more involved with beef and now has a good understanding of how sustainable beef production works nationally. Dr Holmes’s special interests are commercial beef, sheep and wool production, agricultural sustainability, finance and sensible wealth creation through investing. He is a hard-line disciple of the ‘evidence-based’ school of thinking and strives to have that approach dominate debate on Australian agricultural issues. 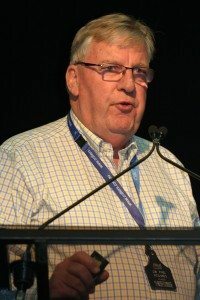 Dr Holmes was one of the pioneers of agricultural benchmarking within Australia and has contributed significantly to the understanding of profitable pastoral production across Australia. Whilst the majority of his professional experience is in southern Australia, his PhD examined the sustainability of beef production in the arid rangelands. The fundamental research question was ‘Is it possible to concurrently achieve financial and environmental sustainability in the arid rangelands as a beef producer’? There is probably one thing missing. Do not fall in love with money. In my opinion I read too many articles where the only measure of success is the amount of profit you make. Many beef producers I talk to, for them, profit is not the be all and end all of success. Perhaps they are in the 75% as well.